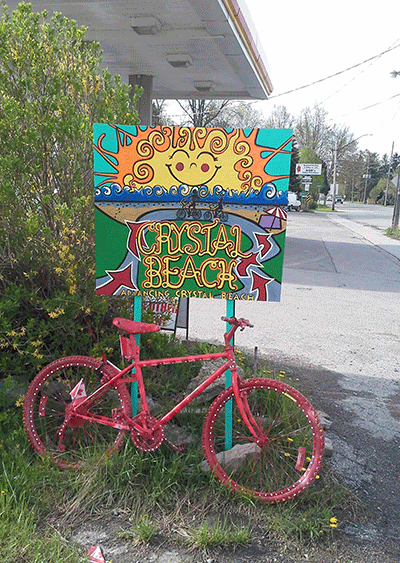 We erected colourful bicycles and signs just off the Friendship Recreation Trail in an effort to attract more cyclists off the Trail and into Crystal Beach to see our village and what it has to offer. There are two bicycles on Gorham Rd. just south of the Trail and one at Point Abino Rd. beside the Trail. Ontario By Bike. Six Crystal Beach businesses were willing to have themselves declared bike friendly with decals in their windows so cyclists could access their facilities. Broken Spoke (Aubrey Foley) at the Port Colborne High School to access several bicycles for new immigrants at Matthew House and about 22 children in Crystal Beach. The Fort Erie Active Transportation Committee who supplied bike repair kits to the businesses. Crystal Beach Beautification Committee to promote their Beautiful Bicycles throughout Crystal Beach. Venture Niagara which has included Crystal Beach cycling information in their Niagara marketing material.